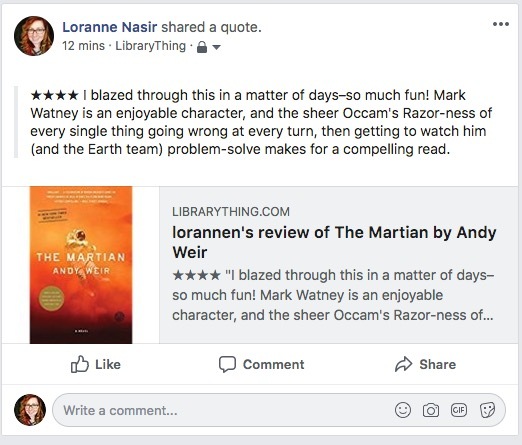 Sharing your reviews, book adds, and other LibraryThing activity got an update! To test it out head over to Your Feed and click the “Share this” link next to the action you’d like to share. Here’s what a posted review looks like today. In August, Facebook ended its old publishing actions API, meaning websites (like LibraryThing) that had built out features for sharing directly to Facebook had to rebuild those features from the ground up. Some sites and services, such as Twitter, simply disabled this feature. Those of you following along on the bug report might remember that we temporarily disabled our share to Facebook feature, too. LibraryThing’s developers (especially Chris C.) spent the last couple months rebuilding our Facebook sharing capability. If you’re not already logged into Facebook, you’ll be prompted to sign in, otherwise, you’ll see your post draft appear right away. Posting a review links directly to the reviews page, with yours appearing at the top. Sharing a book you’ve added will link to your unique book page. Review text: previously, we were unable to pull the text of members’ reviews into the body of the post itself. The link showed a snippet of your review (and it still does), but your rating and the full text wouldn’t be visible. We’ve fixed that. You can opt to show that rating and review text (like the screenshot above), or click the ‘x’ while composing your post to show only the link and snippet, like so. 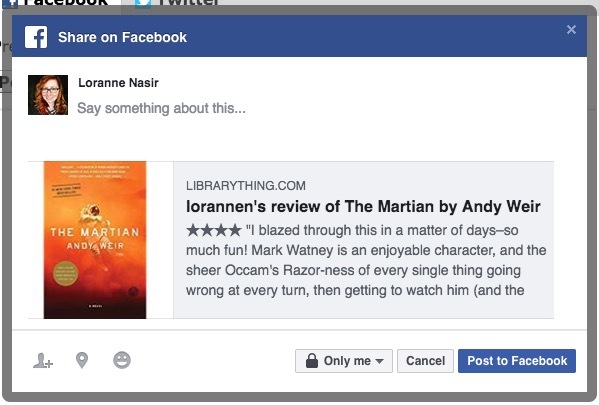 Linking your LibraryThing and Facebook accounts is no longer required to share things to Facebook. This feature is still useful for finding Facebook friends (see Friend Finder below) who are also on LibraryThing, but it has no effect on whether or what you can share from LibraryThing to Facebook. You can still link or un-link your accounts here. Find out which of your Facebook and/or Twitter friends are on LibraryThing, too! Use the Friend Finder to see your friends on LibraryThing, and send invites to those who aren’t. We’re still working on improving the cover images that display with sharing book adds. We also want to hear from you—try it out, and tell us what you think on Talk.